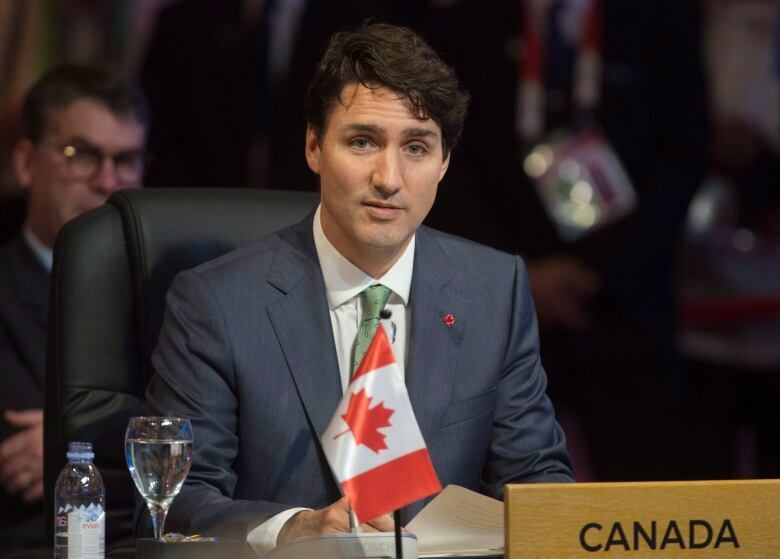 After pleas from Filipino activists, Prime Minister Justin Trudeau raised the issue of human rights violations with Philippines President Rodrigo Duterte on the sidelines of the Association of Southeast Asian Nations summit Tuesday. 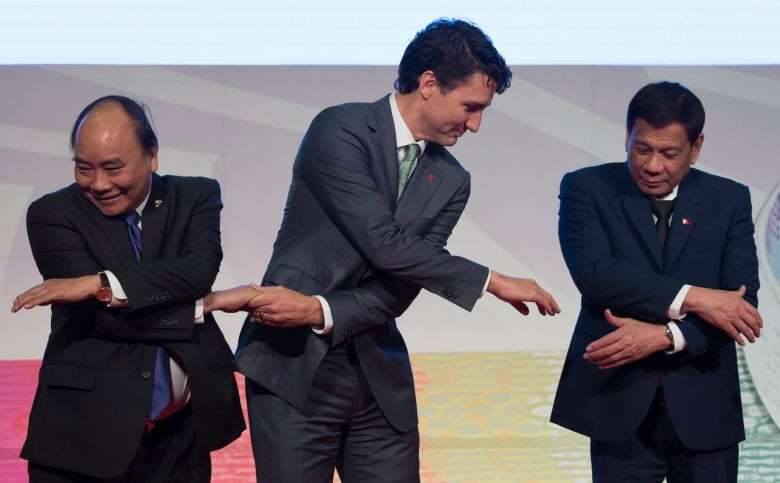 After pleas from Filipino activists, Prime Minister Justin Trudeau raised the issue of human rights violations with Philippines President Rodrigo Duterte on the sidelines of the Association of Southeast Asian Nations (ASEAN) summit Tuesday, a conversation Trudeau described as "cordial." Human rights activists the world over, including some lawmakers in the European Union, have urged Duterte to end his bloody crusade against alleged drug dealers and addicts that rights groups say has left at least 7,000 dead. Duterte has said all such killings are legal acts of self-defence by police — or have been carried out by "vigilantes" with no ties to the president — and he has vowed to continue the anti-drug campaign until the end of his presidential term in 2022. Duterte maintains tough police action — eliminating crime by eliminating criminals — is necessary to restore order in a country that has seen a surge in drug-related violence. "Canada has earned a reputation for being able to have strong and frank, sometimes firm, discussions around the rule of law and human rights with its partners. It's very much what people expect of Canada and it comes as no surprise when we bring it up," Trudeau told reporters at the final news conference of his whirlwind eight-day swing through Asia. "The president was receptive to my comments, and it was, throughout, a cordial and positive exchange." Indeed, as reporters were led into a room where Trudeau was poised to meet with ASEAN leaders for the first time, a member of Duterte's entourage approached the Canadian leader smiled, and asked to take a selfie with him, a potential sign the conversation on this difficult issue was not so frosty as to sully the relationship altogether. The man was later identified as Delfin Lorenzana, the defence minister in Duterte's government. Canadian officials had previously warned reporters that a meeting between the two leaders was unlikely given Duterte's busy schedule as the host for the ASEAN summit, but a chance encounter ahead of another previously scheduled meeting gave Trudeau the opportunity to put his concerns on the record with the colourful, and often controversial, Filipino leader. The exchange with Duterte comes after a coalition of Filipino and Canadian activists initiated a letter-writing campaign, urging Trudeau to raise the "appalling" state of human rights. "This shocking number of killings is accompanied by what seems to be complete impunity for those responsible," the Coalition for Human Rights in the Philippines said in a letter shared with CBC News. "We are deeply troubled that the victims of this state-sponsored violence are predominantly from poor, vulnerable and marginalized sectors of Philippine society." Despite the selfies, Duterte, who has been called the Trump of the East for his brash style, went on the attack when asked about Trudeau. "I said I will not explain. It is a personal and official insult," the Philippines president answered, although he did not refer to Trudeau by name. It's not the first time Duterte has gone after a Western leader. Last year, he cursed former U.S. president Barack Obama for raising concerns about the war on drugs and he subsequently declared that he was breaking ties with the United States. The U.S.-Philippines relationship appears to be on sturdier ground now that Trump is in the White House. On Tuesday, Trudeau said Canada is open to improving relations with ASEAN — which includes Singapore, Brunei, Malaysia, Thailand, Indonesia, Vietnam, Philippines, Laos, Cambodia and Myanmar among its members — and has launched exploratory talks on a free-trade agreement, but any talk of trade must be paired with "constructive engagement" on human rights, he said. The prime minister said it is not just killings in the Philippines that has preoccupied Canada; he also reiterated his concerns about the plight of Rohingya Muslims in Myanmar. In his conversation with Duterte, Trudeau acknowledged Canada's record of human rights is not blemish-free. "We are the first to mention that we are not perfect either, that Indigenous Peoples in Canada have suffered, been neglected, and faced marginalization and mistreatment for decades, indeed centuries." 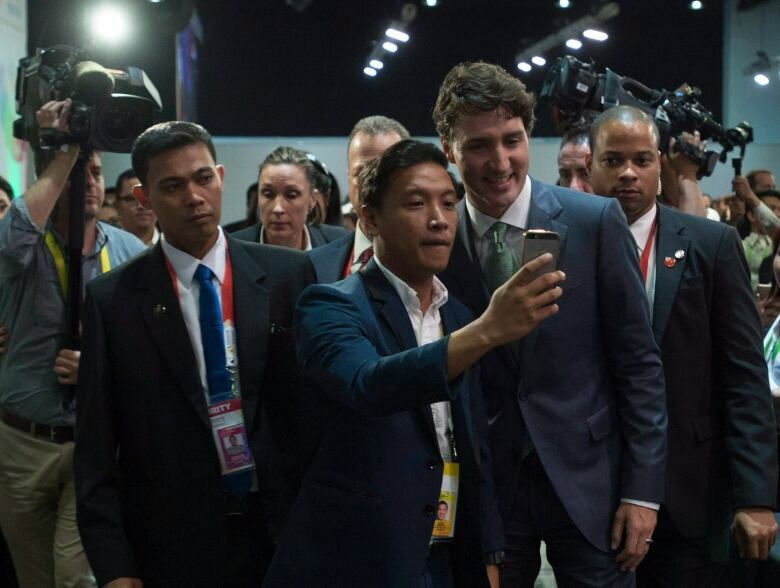 After the brief bilateral meeting — and that selfie with a staffer — Trudeau made a pitch to ASEAN countries to allow Canada to join the East Asia Summit, a key forum for regional and global security discussions. Trudeau said Canada is a Pacific nation, and it needs to be part of the "central place" for discussing issues that arise in the region. "Canada is deeply committed to multilateral institutions and [forums], and the East Asia Summit is an important one in an extremely compelling region of the world," he said. When he was U.S. president, Barack Obama attended every East Asia Summit — except one, when he faced a federal government shutdown in 2013 — as he saw the EAS as the best forum to assert American influence on Asia-Pacific affairs. "Canada is not only willing, but ready to be a key partner," Trudeau said. In addition to the speech before member countries, Trudeau has also appointed an ambassador to the ASEAN region, Marie-Louise Hannan, following the recent appointment of envoys to Cambodia and Laos, meaning Canada has diplomatic representation in all member countries — postings from which a full-scale push for a seat can be launched.